I generally take a quick run through audience stats every morning. I saw this chart and thought "hmm, big day yesterday, why is that?" So I went to google analytics, which confirmed the big day. Like most big days on AVC, it was referring traffic that caused the bump. 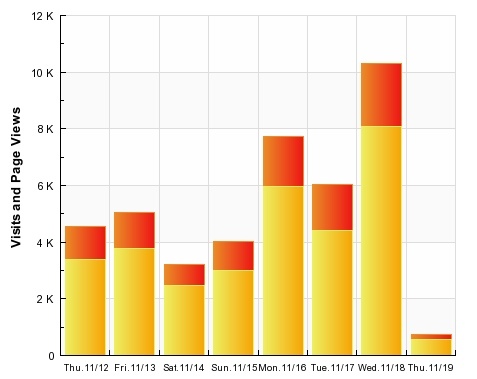 Search and direct traffic are very consistent at about 2,500 visits per day. But referring traffic can be as little as 1,000 visits on a slow day or as much as 5,000 visits or more on a big day. Yesterday was such a day. The twitter traffic is probably undercounted because so many of the twitter click thrus are coming from twitter clients that register as direct traffic. The bit.ly stats on my post yesterday say that there were close to 1,200 clicks on that link from the twitter ecosystem. So that means google analytics is undercounting my twitter traffic by about 75%. The traffic from avc.blogs.com is direct traffic coming from the old URL that this blog ran on. But regardless of all that, yesterday's big day was largely a Hacker News event. 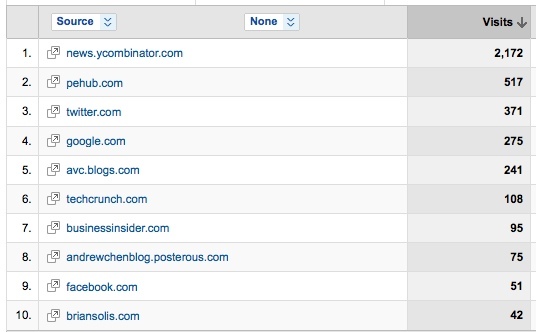 Hacker News runs on news.ycombinator.com and has been an increasingly large source of traffic for this blog in recent months. 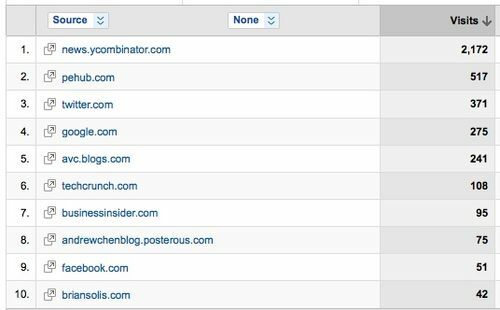 This blog used to get a lot of traffic from TechMeme but since labor day, Hacker News has sent 5x the traffic that TechMeme has sent. I believe that is because TechMeme is largely focused on large professional blog networks and mainstream media whereas Hacker News is peer produced and links out to small blogs like this one all the time. In any case, yesterday was a big day and like most big days it was because others linked out to a post on this blog. That's how the web works and it's always useful to get your head around where the traffic is coming from and going on the pages you control on the web.